Rich M. writes: I have a new 1999 penny. It is significantly thicker than all the other 1999 pennies I’ve seen. Could it be a mint mistake? It is nearly double in thickness. Is it worth anything besides 1 cent? Thank You. What you are seeing is extra height in the rim, not an increase in the actual weight of the flan. You can check this by weighing the coin. It should weigh 2.5 grams. This can happen if the striking pressure of that particular mint press was too high. That would force additional metal to the edge of the coin and increase the size of the already upset rim. The coin could also have stuck to the die and actually struck other blanks (brockage). If this happens for enough blows of the press the resulting error can look like a cup. (At a visit to the Denver Mint with the ANA, I was shown a Eisenhower dollar with rims that were 2 inches tall). The reverse of the coin is usually deformed. 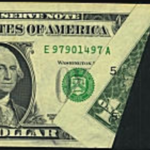 Note that U.S. coin blanks are cut from sheets of stock that are manufactured to specific standards. It is not likely that there would be stock that was twice as thick as normal. This would be detected immediately (The blanks wouldn’t fit through the feeder). Also, even if could fit, there would be tens of thousands or more of identical pieces in circulation. All would get stuck in standard counting machines. This would be a news item. There is a collector base for coin errors and if the error is significant enough, the coin will bring a premium. Randy K. writes: I’m looking for information on a “medallion” “coin” probably a commemorative or souvenir coin medallion. Has no face “currency” value such as $ to it. It has on it a raised portrait of U.S. Grant with Presidency of U.S. Grant across the top. At the bottom it says “The Oceans United By Railroad” and the date May 10, 1869. On the other side it has a raised portion depicting the railroads meeting with “Every Mountain Shall Be Made Low”. Across the top with “Medal Series Of The U.S. Mint”, J. Pollock Director at the bottom and a W. Barber with another mark I can’t make out but might be a “F”. It is about 1 3/4″ diameter and a little more than 1/8″ thick made of “?” and bronze or copper coated. I would like to find out when and where it was minted, what it is made of, and any value it might have, plus any appropriate history of it. This is a United States Mint Medal commemorating the completion of the transcontinental railroad in 1869. William Barber was the Mint Engraver that created the design. The obverse shows a Bust of President Ulysses S. Grant with the legend PRESIDENCY OF U.S. GRANT, in exergue, THE OCEANS UNITED BY RAILWAY MAY 10, 1869. BARBER is on the truncation. The Reverse shows a mountainous landscape in the West with train running to right. A scroll above reads EVERY MOUNTAIN SHALL BE MADE LOW and in exergue there is inscribed MEDAL SERIES OF THE U.S. MINT J. POLLACK DIRECTOR AND W. BARBER F.
The medal is 45 mm in diameter. It was first struck in mid-November of 1869 and reproductions in goldine have been available from the United States Mint since then. The originals were struck in Gold, Silver and Copper. Only one medal was struck in gold and that was presented to President Grant in 1869. The original copper pieces have a deep chocolate finish. The modern reproduction have a golden looking finish. Chris asks: Which is worth more, a pound of quarters or a pound of dimes? Actually, they would have the same value. Even using the current copper-nickel, tokenized coinage the amount comes out the same. This preserves the tradition of when coins were THE money and there had to an equivalent of weights that would not make one denomination coin more valuable by weight than another (i.e. two dimes and a half dime = the same amount of silver as a quarter). If the relationship was random the less valuable coins would be spent and the more valuable coins hoarded (Gresham’s Law). See the calculations below. Current copper-nickel clad dimes weigh 2.27 grams making 13.7 dimes to the troy ounce x 12 (the number of ounces in a troy pound) or 164.45 dimes to the troy pound. Face Value: $16.45. Sheila asks: Do all American coins – pennies, nickels, dimes and quarters have mint marks on them? I have 30 that have no mint mark. Why is this? United States coins dated prior to 1980 have no mint mark if they were minted in Philadelphia. From 1980, all U.S. denominations, except the cent, show a “P” mint mark if they were minted at the Philadelphia Mint. Carl writes: What info can you supply about Victor D. Brenner engraver of the 1909 Lincoln head penny. Area of birth, employment, other facts. Thanks. Born as Victoras Barnauskas in Shavli, Lithuania, Victor D. Brenner (1871-1924) was a turn of the 20th century sculptor who emigrated to New York City in 1890. In 1898 Brenner went to Paris, where he studied with the French medalist, Oscar Roty at the Académie Julian. He won awards at the Paris Exposition of 1900. After returning to the U.S., he embarked on an illustrious career as a medalist. He had a near obsession with Abraham Lincoln of which he modeled medals and plaques. By chance, he was contracted to create the portrait of President Theodore Roosevelt for the Panama Canal service medal. During the long sittings, the two men talked about all kinds of subjects and eventually became close friends. Roosevelt told Brenner about his desire to see a renaissance of artistic designs for United States coinage and his unhappiness with the current Chief Mint engraver’s lack of artistic spark (Charles E. Barber). Roosevelt invited Brenner to submit designs for consideration for the new cent that was to commemorate the centenary of the birth of Abraham Lincoln in 1909. 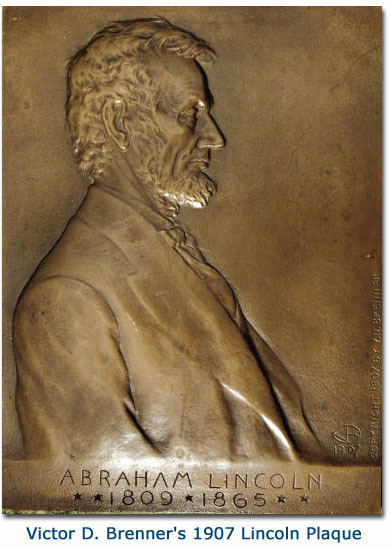 His first reverse design was rejected by the Mint Director (Leach) but the second, featuring two ears of durum wheat was accepted along with the portrait of Lincoln that had graced Brenner’s 1907 medal. When the cent was released in 1909 a controversy arose, mostly instigated by the press, about Brenner’s initials on the lower edge of the cent’s reverse. Most artists sign their work and though other coin designers before Brenner had their mark or initials somewhere on their coins, many felt that the V.D.B. on the reverse was too prominent. The initials “V.D.B.” were removed from the coin completely in September of 1909. That created several varieties of this first year of issue. They were restored in 1918 in tiny, almost invisible letters to the lower edge on the truncation of Lincoln’s Bust. The initials are still there on current Lincoln cents. POSTAGE CURRENCY FURNISHED ONLY BY THE ASSISTANT TREASURERS AND DESIGNATED DEPOSITARIES OF THE U.S. RECEIVABLE FOR POSTAGE STAMPS AT ANY U.S. POST OFFICE. 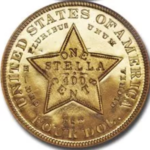 The financial uncertainties at the beginning of the Civil War saw coin hoarding on a massive scale resulting in a shortage of legal tender coins. Trade was severely hampered by the difficulty in making change and it many cases one had to have exact change to make a purchase. Various methods were tried to solve this acute problem. Merchants offered credit slips, tokens and postage stamps in return for change but the public resisted all of these methods. 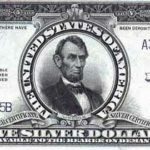 In 1862, the government stepped in to save the economy from disaster by issuing a series of small paper notes that were the equivalent of coins. At first the paper notes borrowed their designs from postage stamps and so the name “postage currency”. These interesting notes are also called “Fractional currency” since their denominations were less than one dollar. 1st Issue – 8/21/1862 – in cents: 5, 10, 25 and 50. 2nd Issue – 10/10/1863 – in cents: 5,10,25 and 50. The “obligation” shows how the fractional notes could be used. They could buy postage, be traded for Legal Tender Notes (note they couldn’t be traded for gold or silver certificates) and they were legal tender up to the amount of $5 worth at a time. Today, examples of all five issues are priced reasonably – from around $20-$50. Was the indian on the Buffalo nickel modeled on a real person? Chris D. writes: We would like to know if the indian on the Indian head/Buffalo nickel was modeled on a real person, and if so, who it was. Thank-you very much. The Indian on the Indian Head or Buffalo Nickel (1913-1936) is a composite portrait of Three Indian Chiefs – Iron Tail, the Chief that faced General Custer at the battle of Little Big Horn, Two Moons and John Big Tree. The idea was to create a Native American portrait but not to associate the facial features with any specific tribe. The reverse of the coin shows a bison, often called a “buffalo”, thought to be “Black Diamond” from the Bronx Zoo. This was the second time that a Native American portrait has appeared on a U.S. coin (the first is on the 1908 gold $2.5 and $5 gold coins). Note that the third instance of a Native American to appear on a United States coin is on the current dollar coin. It features the portrait of Sacagawea, the young Indian guide that helped the Louis and Clark Expedition find their way through the Louisiana Territory. Is there another nickname for the US five-cent coin besides “nickel”? 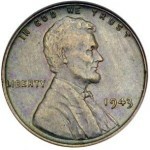 Jacques T. asks: Can you tell me if there is another nickname for the USA five-cent coin, besides the obvious “nickel”? Your help will be much appreciated! Not in the 20th Century. There was a time in the late 18th and 19th century (1794-1873) when 5 cent coins were minted in silver, they were called half dimes. For the prototype 1792 issue alone, the denomination was spelled half disme but pronounced like the word “steam” but with a “d”. 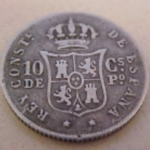 Prior to 1858 when Spanish and Spanish Colonial coins still circulated in the United States as legal tender, worn silver 1/2 reales circulated as the equivalent of a half dime and were called “medios”.